The bulletin board at CURE typically holds announcements and a letter or two. Tucked between the refrigerator and water cooler in the breakroom, it is rarely seen by visitors to the office. It’s really just for us. But in December, it came alive with pictures, notes, and cards and became a stark reminder of the lives we are touching because of the generosity of our donors. Tacked between warm letters such as these are pictures of children we met as bald patients who now are healthy and participating in life as a child should. 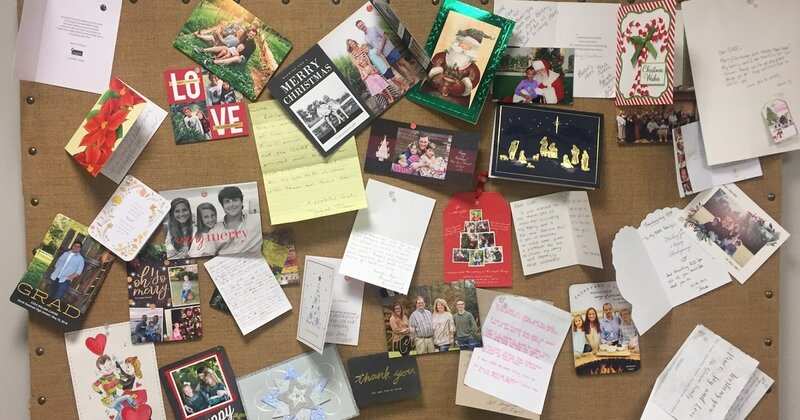 Through the cards from families who have lost their children, we are reminded that our work is still not done; but we’re heartened to know that CURE remains a part of their family’s life and holiday traditions. In that season of giving, you allowed us to do so much for families distressed by childhood cancer. During the month of December, we served nearly 1000 meals to patients and their families in treatment, including a special Christmas Eve meal at both campuses of Children’s Healthcare of Atlanta. Imagine the impact of a warm meal and a smile to those stuck in the hospital instead of at home for the holidays. Imagine also being a parent balancing the high cost of treatment with your children’s wish lists. CURE donors stepped up to tip the scales and became Holiday Angels. Throughout Georgia, our donors provided gifts for 101 families whose Christmas or Hanukkah gift giving was unlikely. Between our little cancer fighters and their siblings, 300 children experienced holiday joy with gifts from their lists. None of this would be possible without the generous support of donors like you. As we settle into a new year, we’re heartened to know your support didn’t end in December. You are with us all year long, and from the bottom of our hearts, we are thankful.